I hope all of us remember the Peter Schiff video posted on ReturnToExcellence.net in September in which Mr. Schiff brilliantly testified before the House Of Representatives Subcommittee On Regulatory Affairs, Stimulus Oversight, & Government Spending – still sounds like a name out of Atlas Shrugged to me. A typical comment after hearing Mr. Schiff was "I've got a new hero! He just nails it!" See posting dated September 27, 2011 entitled Coke CEO Confirms Schiff Testimony - China More Business Friendly Than America. Last week Mr. Schiff went to OWS with a sign that read "I am the 1% – Let's Talk." Click here for Part A & here for Part B to see this first hand account of someone trying to give the answer away for free to people who just can not see, hear, or get it - yet. Now Peter Schiff went to OWS once – our Financial VP, who works on Wall Street, stops by to see the demonstrators virtually every day. He wrote – "And Wall Street demonstrators: I see you every day and wish you would take initiative by learning skills the private economy demands. If so I would be more than happy to assist you in potential internships." I am humbled by the efforts of these two great men. We need more thinkers like this ,stating the message, LESS GOVERNMENT!! Most people just don't get it. Keep up the good work Doug and Carol. I just got back. Had 2nd amicable conversation there. I pick my spots carefully. Few police by me and a peaceful looking guy my age holding a sign advocating taxing wall street more. After cordial intros we reached common ground about unfair tax code breaks -- that most of these add little or nothing to the economy. 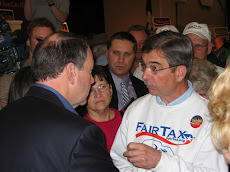 I then proposed the solution - Fair Tax, stressing 3 main points -- elimination of these tax breaks and guarantees that Fair Tax remains progressive, and revenue neutral. i gave more details about progressive requirement. He listened intently, spoke little. I gave him your site and encouraged him to research about FT. Hopefully he will and share with his colleagues. 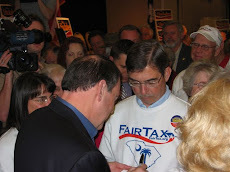 I did recall 1 sign few weeks ago asking for elimination if the income tax.